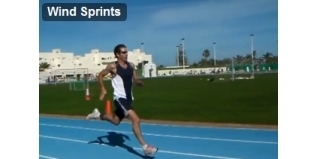 In the second of his video demonstration blogs, Mike Trees looks at wind sprints as a way of improving your leg cadence. By keeping the wind sprints short (about 50m) you can replace an easy run with this session, which is a more efficient usage of your time. Do at least six sprints each time, and concentrate on form and leg speed, not stride length. If you can run with the same stride length and increase you leg speed you will run faster. If you limit sprinting to about 6-7 seconds you will work leg speed without building up lactic acid. This reduces muscle soreness the next day.